The weekend was wonderful. 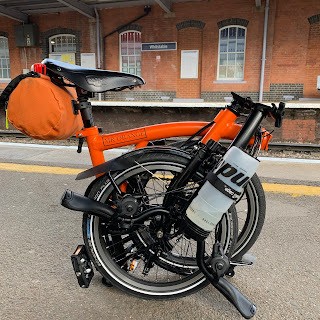 Saturday was the launch event of the Brompton World Championships and as you can read on my previous blog entry, I loved it. How different a few days can make. Looking back the event on Saturday was almost like a last meal before a terrible fate. This terrible fate happened on Monday. Those of a nervous or squeamish disposition my want to give what will follow a miss. You have been warned. My 40th was not too long ago. I have been happily married for 15 years and have two lovely children. We tried for a third but sadly it wasn't to be. Partly because of this my wife and I decided that a vasectomy was the easiest option as we didn't want to go through it all again. Mine was booked for Monday. I Bromptoned to the tube, took the tube and then Bromptoned to the location where the vasectomy was to be carried out. There I met my father in law who had driven up and put my beloved Brompton in the boot of his car and drove off to find a suitable parking space. I noticed that the location where my vasectomy was to be carried out was also a STD clinic. This induced me to speak louder than I normally would and state to the receptionist that I was here for a vasectomy hoping this would convey I was not connected with anything STD! I was taken through the door of certain doom but to my surprise I came to a very small room 6 foot sqaure and told to take my shoes off. My quip that I would like to go out with my shoes on, fell on deaf ears. Shoes off I went through the real door or doom. Normally the first thing I say to someone is, 'What ho,' or just a plain old, 'Hello. How do you do?' The doctor took one look at me, told me that his name was Kenneth and that I needed to pull my cargo shorts and pants down to my ankles and lie down on the bed. At least he had the decency to tell me his name. I suppose in this day and age people are quite familiar with each other. I did what he said. He prodded around, told me that he was going to numb the area and that there was going to be, 'a small prick.' (I suspect this was a particular favourite statement of Kenneth's). Kenneth then started to chat for England. Within the next minute or so he chatted away and had asked me what I did for a living. He asked what made me want to do this job? I answered. There was then a slight lull in the conversation so I said, 'So Kenneth, what made you want to do this for a living?' After this I did not hear another word out of Kenneth for a while. Kenneth started to prod around asking me it I could feel anything. I couldn't, thankfully. He then started the procedure. Even though I felt nothing I knew full well what was going on and started to feel light headed. Within a few minutes it was all over. Whilst still on the bed, Kenneth told me to get up slowly and pull my pants right up, so to aid support. Walking out to the small room I carefully and slowly put on my trainers and was led to the sun lounger. I felt I walked like Clint Eastwood rather than John Wayne and was quite please as I always liked westerns that he was in. Soon a nurse presented me with a cup of tea and a packet of custard creams. A further two cups of tea and some ginger nuts later, I was still waiting for my father in law to collect me. The waiting area was starting to fill up and needing some fresh air I decided to give up my seat. Like Captain Lawrence Oates I said my goodbyes and said that I may be some time. Clutching my brown paper bag I headed out into the fresh air. This proved to be a mistake. Standing was not the best of things to do. I saw a wooden bench not too far away but felt that I wouldn't make it. I ended up leaning on a lamppost to support myself. Eventually my father in law arrived. I boarded and was whisked home. At home I received very little in the way of compassion, sympathy or understanding. From friends I received even less. Visitors came trying to hide their smiles, while other openly found the tale I retell here hilarious. I retrieved a bag of frozen peas and placed them on, as a close friend commented my crown jewels - for obvious reasons and sat there saying whoa is me! If my crown jewels had of been real I would have been a wealthy man as they had more than doubled in size! Tomorrow I return to work. This may prove to be difficult as I still walk with a limp. I only hope that things calm down and that I can resume riding my Brompton. For the moment however getting on my beloved Brompton is something I definitely can't do! Hello, Is everything all right after the vasectomy? I really like your blog and would like to subscribe your blog. Please check mine as well. Yes getting there. Will check your blog out too. Many thanks. Read with a smile, great post honest and real. When I saw the title I thought it would describe you,a muppet walking in front of you texting, brakes and brompton frames in some gruesome collision type injury.